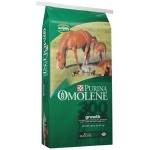 For foals and lactating mares being fed with their foals... Purina® Omolene #300® Horse Feed contains the Purina® Amplify® Nugget, a patented, high-fat, extruded particle that contains a proprietary blend of vegetable oils, flax seed and rice bran for an optimal fatty acid profile. Please contact the store for pricing. 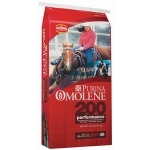 For performance, breeding and growing horses... Purina® Omolene #200® Horse Feed contains the Purina® Amplify® Nugget, a patented, high-fat, extruded particle that contains a proprietary blend of vegetable oils, flax seed and rice bran for an optimal fatty acid profile. Please contact the store for pricing. 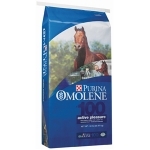 For light to moderately worked horses... Purina® Omolene® Horse Feed delivers consistent, superior quality that helps keep your horse looking great. Please contact the store for pricing.